Malaga Airport is recording despite the crisis increases for the second consecutive year in both passenger numbers and flight operations. Nearly 13 million passengers have passed through these facilities throughout 2011, which implies a return to the figures recorded in 2006 before the economic downturn, although it has not yet reached the maximum of 13.5 million passengers recorded in 2007. Thus, Malaga continues as the fourth busiest airport in passengers and operations in Spain, behind Madrid, Barcelona and Palma de Mallorca. According to data provided by Spanish Airports and Air Navigation (Aena), most of the passengers at Malaga airport between January and December (12,762,465 specifically) traveled on commercial flights. 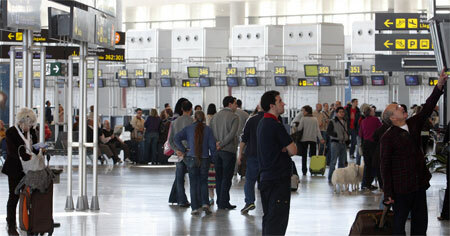 Of these, 2,665,348 persons flew between Spanish cities, representing an increase of 4.6% over the same period last year. The remaining 10,097,117 people traveled on international flights, a 6.9% increase.